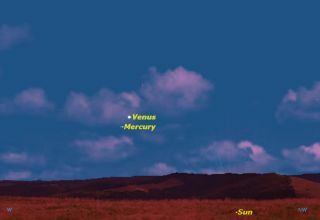 On the evening of Thursday June 20, Mercury reaches its maximum elongation east of the sun, placing it directly below brilliant Venus in the evening twilight sky. Don’t miss your chance to see Mercury in the night sky as the northern summer kicks off. For the next few nights, Mercury will be a tiny speck just below Venus. It is closest to Venus on July 20, slightly less than two degrees away, but will also be very close one night earlier or later. The best time to see Mercury is about half an hour after local sunset. Any earlier, and it will be lost in the sky's glare but much later and it will be too low to see. It is most easily spotted with binoculars, but once you've located it, the planet should be relatively easy to see with the naked eye. The seasons are caused by Earth's tilt. In the Northern Hemisphere it is summer when the Northern Hemisphere is tilted towards the sun. This week also marks the summer solstice, on Friday (June 21) at 1:04 a.m. EDT (0504 GMT). The sun will reach its most northern declination, marking the middle of summer in the Northern Hemisphere and the middle of winter in the Southern Hemisphere. Because the sun is as far north as it can get, it is above the horizon in the Northern Hemisphere as long as is possible. At local noon, it will be as high in the sky as it can get. These two factors combine to create the maximum solar heating possible in the hemisphere. In the Southern Hemisphere, the opposite is true. The day is as short as it can get, and the sun is low in the northern sky, giving little warmth. If June 21 is the "midsummer" or "midwinter" day, why is it that we always think of the seasons as beginning on this day? It's because it takes time for the sun to have its effect, causing the seasons to lag behind the sun, making the hottest days of summer (or the coldest days of winter) come a month or two after the solstice. The solstices have always been important dates for humans. Most calendars mark the beginning of the year close to the winter solstice. Determining the exact date of the solstice was important to fix the calendar, and structures like Stonehenge in England were built to make accurate measurements of the sun’s rising and setting points. Editor's note: If you snap an amazing photo of Mercury in the night sky, or any other celestial object, and you'd like to share for a possible story or image gallery, please send images and comments, including location information, to Managing Editor Tariq Malik at spacephotos@space.com. This article was provided to SPACE.com by Starry Night Education, the leader in space science curriculum solutions. Follow Starry Night on Twitter @StarryNightEdu. Follow us @Spacedotcom, Facebookand Google+. Original article on SPACE.com.